→ Use of props, such as blankets, blocks and straps, to facilitate learning and adjust poses to an individual’s needs. → Highly developed teaching methodology including the precise use of language, demonstration and teaching of specific points of action in a pose, individual correction and adjustment of students. → Ways to use yoga to ease various ailments and stress. → Complete integration of the yoga philosophy with the practice of asana. Yoga is for everyone. No one is too old or too stiff, too fat or thin or tired. A Certified Iyengar Yoga teacher can guide students of all ages and physical conditions to an experience of yoga which is safe, accessible and rewarding. Certified Iyengar Yoga instructors are held to an unusually rigorous standard. Only after years of training and evaluation do they become certified. Iyengar Yoga teachers modify the classic asanas (yoga postures) for individual students with the use of props, such as blocks, blankets and belts. Props allow for a deeper penetration into the posture, as well as a longer stay. 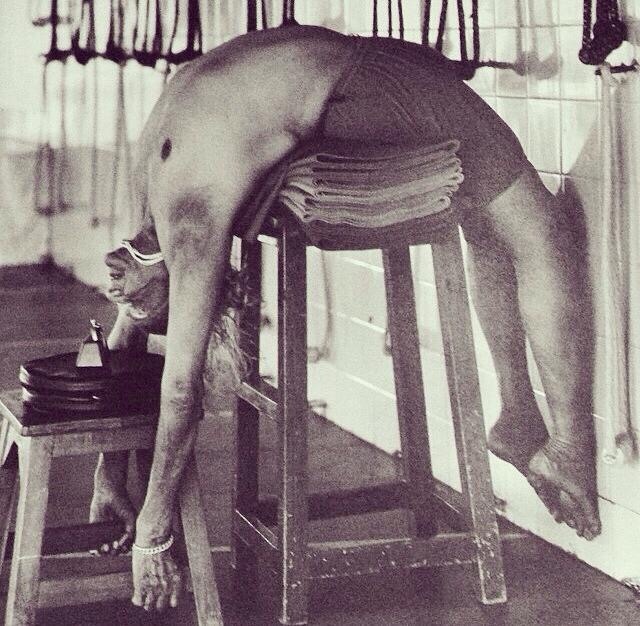 Iyengar Yoga teachers use their deep-seated knowledge of the asanas to individualize corrections for each student. Students know they are observed and, if necessary, adjusted. Students of Iyengar Yoga begin with elementary postures with an emphasis on the standing asanas (postures). In time other postures are added, including forward bends, back bends, twists, inversions and restorative poses. Salamba Sarvangasana (Shoulder Balance) is introduced as soon as students are ready because of its many therapeutic benefits. Each class ends with Savasana (corpse pose or deep relaxation). Students learn to rest in a profound way, completely releasing the body while drawing the mind towards the peace within. Teachers create sequences of poses which build skill and understanding from posture to posture and from class to class. Students are encouraged to develop their own home practice – without one the study of yoga is incomplete. Look for the Mark – Only Certified Iyengar Yoga Teachers teach genuine Iyengar Yoga. The Iyengar Yoga Teachers Certification Mark is a sign of excellence, clarity and depth of understanding. To be a Certified Iyengar Teacher and to use this logo, the teacher must be properly trained, certified and maintain his or her development.